Hi! We're Taylormade... we want to help make your wedding day the most incredible day of your lives! We've been filling dance floors at weddings all over the UK since 2008. This means we're an experienced, professional Live Band who really know how to make the evening go with a swing! We bring our own infectious style to a great mix of Pop, Rock, Indie, Soul and more; from the floor-filling classics to the latest hits. We offer two line ups - a 4 Piece with Vocals, Guitar, Bass, & Drums and a 5 Piece with Vocals, Guitar, Piano/Keys, Bass, & Drums, which means we can cover a huge variety of tracks. We also offer 'add-on' options - a DJ to keep the party flowing, and Acoustic Duo/Trio options that make for the perfect wedding ceremony or drinks reception. So, we offer the entire wedding day's entertainment, in one easy choice. We come highly recommended, too. Not only by the many happy couples and event organisers we've played for, but by dozens of top wedding venues. We love what we do, and have a great reputation as one of the best Live Wedding Bands available, in our home county of Northamptonshire and across the UK. You're also very welcome to come along to one of our regular, free 'Showcase Events' to see and hear us play live for yourself, before you book - something that not a lot of Wedding Bands offer. Why not pop the kettle on and take a moment to explore - watch our videos, listen to our recordings and importantly read the glowing reviews we have received from the hundreds of weddings we have performed at. You can also see what we've been up to lately in our Wedding Band Blog. Like what you see? Get in touch below for our pricing and to check availability for your wedding or event - it only takes a moment! Please provide a mobile number so we can text you to let you know we have sent your quote. Don't worry - we won't call you unless you tick the telephone box below. Are you interested in the following 'Add-Ons'? Would you like to come along to a Showcase and see us play live? Weddings are most definitely our 'thing'. We've performed at hundreds of weddings across the country and offer live music for every part of your big day. From your Ceremony and Drinks Reception through to filling your dance floor - we're your band! From Balls to Office Parties, Christmas Parties to New Year's Eve, we've played everything over the years, big and small. We've played events for large companies, the British Armed Forces and many great charities. We can bring some great music to your event too! Parties, Anniversaries, Birthdays, you name it...they're always better with a Live Band! Whether it's a chilled out gathering or a full on party you're organising, we'll make sure the atmosphere is spot on with performances that hit the right note! We believe it's really important for you to know how the band you book will look and sound on your wedding day. That's why we have made a selection of live recordings (without studio 'tweaks' and absolutely no auto tune!) and our ‘Taylormade Live In Session’ video which is 100% live - raw and un-tweaked! This was taken by Alive Network at their recording studio in The Midlands. We've also included our wedding promo video for our Acoustic Duo, so you can see just how we'll add a stunning soundtrack to your wedding ceremony or drinks reception during the daytime aswell. This video was taken at the gorgeous Crockwell Farm Wedding Venue in Northamptonshire by Jonathan Ruffle at Fresh Wed Videos. Sure, we could have made a video with loads of overdubs, put in extra instrumentation and lots of over the top studio production but that wouldn’t be what you’d get on the night - and that just wouldn’t be fair to you. So these videos show you why we are one of the leading Live Bands for weddings across Northamptonshire, the Midlands and the UK. Once you've watched these videos, why not come and see us playing live for yourself at one of our regular 'Showcase Events'. We’re very proud of our live sound and they are also a great chance to say 'hello' in person and chat with us all about your wedding or event. Like what you’ve seen? Please get in touch here. We've got a great selection of tunes - tried, tested and certified dance floor fillers! Our repertoire spans a wide range including Rock, Pop, Indie, Soul and Dance tunes. 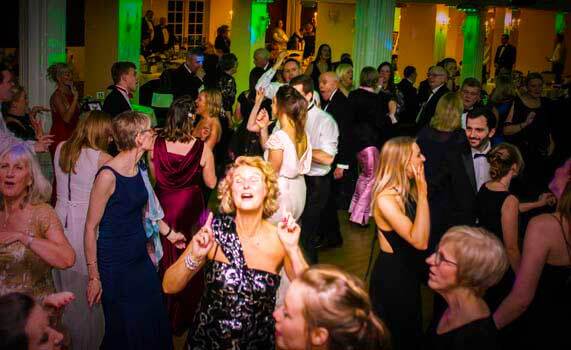 We play a real mix so there's something to get everyone up and dancing - particularly important at weddings! To be a little different, we put our own spin on songs that you may not really expect a Wedding Band to play (Lady Gaga, or Justin Timberlake for example! ), creating our own medleys to seamlessly change between songs. It's part of what makes a great live show and a great night. Got a special song in mind for your First Dance? If we don't already play it, we can learn it for you! Our DJ 'add-on' option allows you to keep the music going and the party flowing until the end of the night. We mix the songs, take requests and make announcements just like any professional DJ - this all fits seamlessly with the Wedding Band's performances, so that the music and party atmosphere continues even when we're not playing! Because we use the same professional PA system for our Live Band and DJ sets, the room won't be cluttered up with lots of equipment, it helps keep costs down for you. It's also so much easier to deal with just one supplier! Our DJ 'add-on' is available as standard until midnight. If you would like to party for longer, no problem! We can extend the DJ set until even later by request.  “Myself and my husband were so pleased with the service, our guests raved about them - we highly recommend Taylormade!